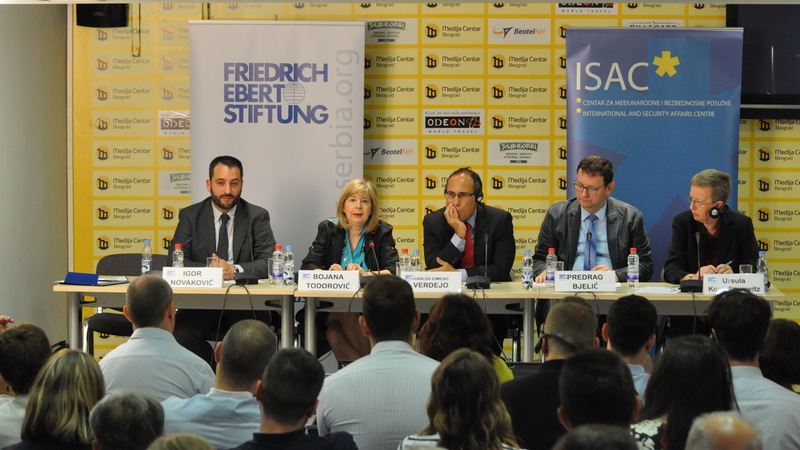 ISAC Fund in cooperation with Friedrich Ebert Foundation organised the international conference “The Accession of Serbia to the WTO and the EU during the Populist Challenge to International Free Trade”. Held in the Media Center in Belgrade, the conference featured panelists Carlos Gimeno Verdejo, coordinator in DG Trade at the European Commission, Bojana Todorović, former Assistant Minister for Trade, Tourism and Telecommunications, Dr. Predrag Bijelić, professor at the Faculty of Economics at University of Belgrade and moderator Dr Igor Novaković, Research Director at ISAC. The panelists agreed that the WTO is a positive force for preventing protectionism and isolationism and that it is in Serbia’s best interests to join. Accession to the WTO would give Serbia an opportunity to easily regulate its foreign trade and protect its own interests in the global market. It would also make Serbia more attractive to foreign investors and open it up to formerly inaccessible foreign markets, spurring long-term growth. And most importantly, accession to the WTO would bring Serbia closer to closing EU accession negotiations on Chapter 30: External Relations. Many of the panelists mentioned that Serbia’s WTO negotiations have essentially boiled down to one issue: the regulation of products that contain GMO. Serbia insists on tha absolute ban of the trade with GMO products, but the WTO policy mandates that no particular good can be banned. But the panelists stressed that this obstacle is easy to overcome if the Serbian government takes initiative, and solves this issue in protecting the interest of the citizens of Serbia. ISAC Fund also presented two new policy analyses at the conference under the titles „Why is the WTO Important for the EU“ and „Why Serbia Should Enter the WTO“, as well as the the translated and adapted version of the WTO original publication 10 Things the WTO Can Do.